Within the medical realm, the word “holistic” refers to something that is “characterized by the treatment of the whole person, taking into account mental and social factors, rather than just the physical symptoms of a disease.” Basically, this means that a holistic medical professional takes a long-range look at things. Not only do they treat immediate problems, but they also consider how the treatments they provide will affect a patient’s long-term and overall wellness. A holistic dentist, therefore, never forgets that what happens in the mouth can have a profound affect on what happens throughout the rest of the body. That is why they choose materials and offer treatments that pose as little risk as possible to patients. Both general dentists and holistic dentists must complete dental school and engage in ongoing continuing education to maintain their license to practice. Many general and holistic dentists are very skilled, and they genuinely care about their patients. However, that is where the similarities end. A holistic dentist takes things a step further. They tend to take a more personal approach to dentistry, taking the time to get to know each patient’s unique needs and concerns. They may also be more diligent about investing in the latest dental technology. Safe mercury removal. Amalgam fillings are commonly used at traditional dental practices. However, they contain a high amount of mercury, which is toxic. A holistic dentist can remove such restorations safely and replace them with a biocompatible, metal-free alternative. Ozone therapy. Enriched oxygen can make many dental procedures less invasive. For example, it can help a dentist remove as little healthy dentition as possible when preparing to place a filling. Most traditional dentists do not use it. Biocompatibility testing. A holistic dentist may test how your body reacts to various materials before incorporating them into your treatment. This is not a standard practice among traditional dentists. Drug-free relaxation. 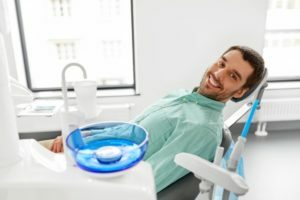 Sedation is a valuable tool that helps patients relax, and many general dentists use it. Sometimes, however, a drug-free alternative can relieve anxiety just as effectively. NuCalm is an innovative system that uses the science of how the brain works to produce a powerful calming effect. Holistic dentistry is the best type of oral healthcare. Once you experience it for yourself, you may never want to visit a traditional dentist again! Dr. John Hamel has been working as a dentist since 1985. Before that, he was a technician in a dental lab. His extensive experience and education, along with his dedication for looking after his patients’ whole-body wellness, help him to provide the best holistic care available. To learn more about Dr. Hamel and the benefits of holistic dentistry, contact our office at 770-426-9994.